This new device, the Acer Chromebook Tab 10, is perhaps the biggest paradigm shift in the mobile space since Apple’s 2010 introduction of the first iPad. How can that be, you ask? The main reason: The Chromebook Tab 10 is the first tablet to combine the now common experience and simplicity of mobile apps with a true desktop browsing experience. The first point has to do with Android app support through Google Play. Without this, the Chromebook Tab 10 would be like a Chrome OS device from two years ago with the user constrained to living in browser with web apps and extensions. For some people, that’s just too limiting. Android app support, however, brings a nearly infinite number of possibilities to this tablet, just as it does to the Pixelbook I currently use. I’d admit it’s been slow going to get a positive app experience on Chromebooks: Android app support was announced in May of 2016 and back then, it was a very hit or miss type of experience. Fast forward to present day though and it’s far better: Not perfect, but it’s getting there. While everyone’s needs and app choices are different, the Android apps I use on a daily basis work so well on my Pixelbook that I sold my iPad Pro 12.9, for example. And while there’s still some work to be done here, it’s clear to me that Google’s long term strategy for Chrome OS is to keep improving Android app support on the platform. So I’m reasonably comfortable in saying that it will get better. So Android app support tackles one of the key reasons people in the past haven’t considered Chromebooks. The “app gap” essentially goes away since there were 3.5 million apps in the Google Play Store as of the end of 2017. Equally as important for Chrome tablets though is that these are the first tablets running a modern operating system* to provide a desktop browser. What does that mean? The best example is one you can do yourself. Try some web apps on your desktop or laptop and compare the experience to that of your phone. It doesn’t matter if you use Mac OS X and iOS for this or Chrome on a computer and Chrome on your phone or tablet. If not immediately, over a short period of time you’ll see the limitations of a mobile browser: Moving through different fields on the page, text entry challenges, limited or no support for browser extensions and some features that simply don’t work or don’t work well. That’s because mobile browsers were designed for mobile activities and input. The base functionality of browsing and interaction is there but it’s still limited. This is why there are native apps for software that also runs in the browser. Try Google Docs on the web using a phone or tablet — if you even can; Google nudges you to download the mobile Docs app — and you’ll likely find that using the Google Docs app is a better experience on mobiles to further illustrate this point. A true Chrome tablet fixes this issue because it doesn’t run the Android version of Chrome; instead it runs “real” Chrome. Those issues and challenges on the mobile browser simply don’t exist because it’s the same version of Chrome you’d run on a traditional computer. That means if you rely on full-featured web apps on your desktop or laptop, you’ll get the exact same experience on a Chrome tablet; it’s not watered down. Combine the broad mobile app support with a full browser experience and Chrome tablets will offer the best of both worlds. Sure, the Acer Chromebook Tab 10 is targeted for classrooms: Like other Chrome OS devices it’s easy to manage, costs $329 and includes a stylus. But in the long term, I expect to see a slew of Chrome tablets in a range of prices for the consumer and business markets as well. They’ll get the benefit of a light, portable device that can be used with a wireless keyboard — although I anticipate we’ll see Chrome tablets that detach from a hardware keyboard this year — along with millions of mobile apps and a powerful, full-featured browser for other activities. * Yes, one could argue that Windows tablets run a modern operating system. But these run a tablet optimized version of traditional Windows; not a new OS that was designed for mobile. I’m with you, Kevin. I’ve been wanting full desktop Chrome in a tablet for years. The combination of “real” chrome with Android apps is a big deal. And all the usual benefits of Chrome OS, like automatic OS updates in the background. I hope Acer will sell these to ordinary adults, not just school districts. A while ago, I tried using a Windows tablet (HP Stream 7) as an experiment. It worked okay as a super-portable Chrome browser. But all the Windows baggage was a pain, especially the foreground OS updates that always seemed to happen when I just wanted to quickly browse something. Also, there’s still a shortage of touch/mobile apps for Windows, compared to Google Play. Yup, I tried a similar setup to what you used: A Surface Pro 3 tablet mainly using just Chrome. But like you said, the baggage of Windows, as opposed to the lightness of Chrome OS, made it frustrating. And of course, we didn’t have Android app support then, so truly optimized touch apps were lacking. One limit I’ve found using the Samsung in tablet mode with the browser is that I still need a trackpad sometimes. I haven’t found a way to do click-and-drag, or to “hover”, with touch or stylus. Hopefully that’s coming soon in Chrome OS. For pure tablet use, I could do 9.7″ but I’m spoiled by using the larger Pixelbook as a tablet. I’d rather have one device that works as both laptop and tablet as needed. But I’m probably in the minority on that one. I don’t think that’s part of Chrome OS yet, but possible good news: Looks like it’s being tested in Chrome for Android: https://www.xda-developers.com/google-chrome-android-gesture-drag-drop-links/ Probably makes sense to start the feature there since there are so many more Android devices in the wild as compared to touch-capable Chrome OS devices. But I would expect it to follow in Chrome OS. I have been using an Asus 202S Chromebook for sometime using both Chrome web apps and android apps although some Andoid apps aren’t compatible. I find that the Chromebook is used more and more and the Macbook Air less except for a couple projects. I read your opinion piece on the Chrome Tablet today and hope that you will discuss it on the next Mobile Tech Roundup. 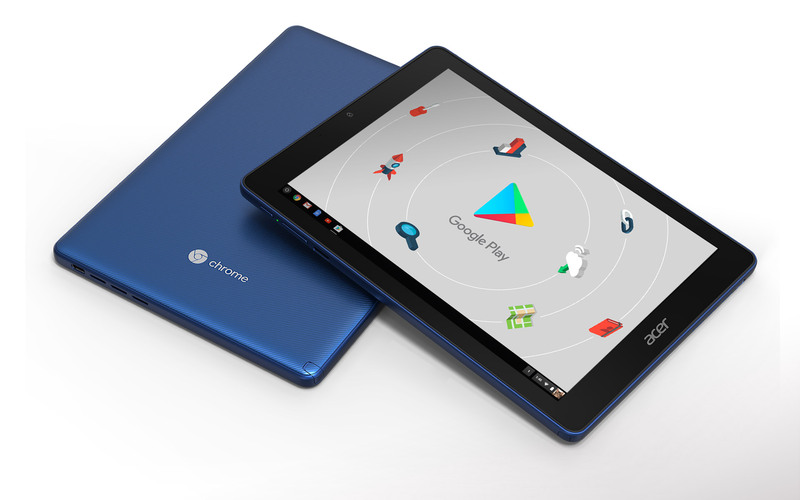 Will this and future Chrome os tablets run all android apps? Will there be a wireless key board? Or would you recommend another Chromebook (more affordable than the Pixel)? I have very little (none, really!) doubt that future Chrome tablets will run Android apps. Google said last year that all new Chromebooks would run Android apps. And by “Chromebooks”, I’m pretty sure they meant Chrome tablets as well, but of course, they couldn’t say that at the time. We’ll be sure to discuss this in further detail on the podcast. I also expect some device makers to build wireless keyboards for the tablets, although any Bluetooth keyboard would work. I’m planning to review the Acer Chromebook Tab 10 but I’d prefer a tablet with detachable keyboard, so I don’t know that I will buy the Acer. That’s just a personal preference. At this point, it may make sense to wait and see what’s around the corner for Chrome tablets; Google has a bunch of Chrome OS hardware partners, so I don’t think the Acer is a one-off product. This will also solve the number one problem of Android tablets to date – updates. I am still nursing a 2nd gen Nexus 7. I have wanted to upgrade to something newer for a couple of years. But what to buy? There are a few good budget choices and of course Samsung has continued making quite decent tablets running Android. But good luck if you ever planned to see a single update on pretty much any of them. That’s not acceptable to me. If Nvidia launched a new Android tablet I would have gone for that. Their attention to updates has been more than proven to me with my Shield Android TV box. However I don’t expect them to go for another round there. Too niche and little support on Google’s side seemingly. Also Nvidia has other much more important pokers in the fire these days. Chrome OS, with its cunning rolling updates solves all of that. It is the very best updating system on the market today, bar none. And I’ll be happy knowing I’ll be able to buy any make I want and get those updates. Well worth the cost in slow hardware adoption to me but I would like to see that better sorted. This tablet launching with an essentially outdated processor is case in point. For the same money the new iPad is going to leave it behind like a Porsche vs a moped. However the browser experience you spoke of and multi-account support are more important to me at the moment I think. Like you though I believe I’ll be waiting for a larger screen. Possibly. I’ve already been waiting forever so maybe I’ll just do it. Oh sweet. If they are going to provide review units to people then it’s a complete certainty they also plan to market this as retail. Either way I’m hopeful you are right that we actually see a number of offering of Chrome OS tablets and detachables this year. But then I thought the same thing this time last year. LOL. I’ll be keeping an eye out for your review. many people point out that Chromebooks are using processors normally found in mobile phones. You say 3.5 million android apps – big wow,, how many of those 3.5 million do you use on a day by day basis? there must be a googleplex number of books in the world but i only have a tiny number of them. I was confused when i started with Chromebooks, disappointed, the apps “were just links to web pages”, and worse just TAB’s in a browser .. coming from “windows” GUI it didn’t FEEL right. I suggest to you, put a web app on the shelf of the chrome book and select “open as window” then the web apps LOOK like a windows pc or a MAC and REAL applications, it FEEL’s “normal” in a window. Android in my humble opinion is already history. Android is just a temporary bridge, a stop gap measure. The future is chrome + progressive web aps & web assembly, write once run on everything. the only “app” is the browser the pages run on. Edge, Fire Fox, Safari & Chrome. You’d think so, but they’re not. A simple example is the lack of extension support on Chrome for Android and Chrome on the desktop or Chrome OS. Also, the user-agent string that identifies Chrome for mobile on a handset tells web servers to render content slightly different from that of a desktop or laptop. You might not have seen the difference but when it comes to working in web apps, the mobile versions don’t have the same functionality or can’t be used at all. This is part of the reason you don’t edit Google Docs on a phone in the Chrome browser; Google created Android versions of the apps to get around this. Thanks for getting About Chromebooks going. I listen to Jeff Jarvis and you talk about Chromebooks on TWIG and then you on Stacy on IOT. That gave me confidence that the platform was promising. Heading to my local stores few premium ones were in stock to consider. When Google had their $250 off deal I jumped at the Pixelbook since I really like my other Google devices. I am a Fortune 150 company IT guy with Windows stuff everyplace, but still no good option for lightweight devices that have good battery life. (I really have tried them all.) Today my Pixel book has been in use for 14 hours and it says it has 2 hours left. Except for Skype for Business, I have all of my work stuff and all of my private stuff. If it didn’t have so many white surfaces to keep clean it would be close to the perfect device. Hey Mark, glad you found the site! I was a Windows guy for 15 years in my IT career at large companies too. Was a Microsoft MVP back in the day. Nothing against the platform because it’s great for particular use cases but I simply don’t need it anymore. Hope to keep you up on the latest news here and glad you’re enjoying the Pixelbook experience. With Linux app support essentially right around the corner it opens up even more possibilities! ?